river was mint till around 9:30 then quick as a flash visibility went down to 8" max, spoiled what was shaping up to be a good day. Guess it hadn't made it to the lower then yet... I left there at around 12:30 and it was still looking nice and green with about 3+ feet vis. left at 245 and was still ok in the lower. around 3 it started coloring up huge. in 30 minutes it went from 4 feet to about a foot. Was fishing Thompson park area maybe it was more like 10:30 or so but it coloured up quickly. Were you the young guy working a spey rod? any updated cond would be appreciated. 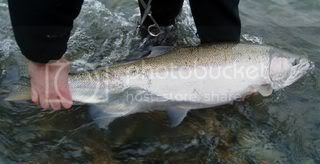 Fred's web site reporting conditions OK today and 2 fish brought in today. Conditions good with many people on the flow, observed some picket fences in a number of runs. Didn't rain all day while out... River was in great shape at 4pm. Raining pretty good now tho. So won't know till first light. If I can get up i'm heading put again FL. I'll update when I get to the river. River looks ok, green color but not a whole lotta vis. Definitely fishable tho. They are expecting 50+mm of rain in the next 24 hours, that will definatly have an impact on the river. Looks like the river levels are on their way back up. No rain yet. Looking grey tho. I found one beauty, pity I screwed up the first tail attempt. I didn't get another chance. I headed out this AM and got lucky! I can't wait to fish ALL the time!